We’d like to let you know about a new sale we’re having. 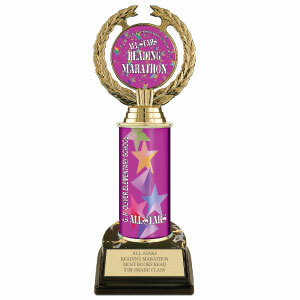 5-1/2″ through 12″ trophies in ALL markets are now 20% off. Equestrian trophies? Check. Dog show trophies? Check. Our new Athletic trophies including the Signature and Superstar series? Yes, them too. You don’t need a key code or postcard to participate– any order from today through June 30th will receive the discount, no matter if you order by phone, web, or email. And better yet, our trophies always include free text engraving. So let’s do a little browsing. We’ve recently expanded our selection of trophy columns and figurine choices. Many of our popular designs used on rosette side streamers now have an equivalent trophy column. Did you know you can even use a custom design on your column? Our popular Ruby Marble series has trophies included in the sale, like this 12″ item with the year in gold trim. Need to give awards for your Spring sports? We have Superstar trophies in softball, baseball, lacrosse, track and tennis. Have a question? Leave us a comment or call Customer Service at 1-800-556-2440. This entry was posted in Hodges Badge Company and tagged dog trophy, equestrian trophy, hodges badge, school trophy, trophies. Bookmark the permalink. ← Have you bought or sold awards on ebay? I need about 105 trophies before Fri. 4/1, is this possible without all kinds of extra rush charges? Please, email a response. Thanks for your inquiry. I have forwarded your request to our customer service manager to see what we can do for you.